As more teachers are looking for ways to post online lessons for their classes, I wanted to continue to highlight available screen recording tools. ActivInspire contains a screen recording tool that can be used to record lessons from flipcharts, Power Points, the internet, or anything displayed on your computer screen. The following video shows how to use the ActivInspire Screen Recorder tool to record your lesson, how to upload that video file to YouTube, and how to embed the YouTube video into itslearning. If you don't see the video, remember to look for the shield at the end of the address bar Click it and select Load unsafe scripts. One of the programs which Forsyth County Schools provides for teachers and students is Voicethread. This program can be used to record lessons to use with a flipped classroom. The lessons can then be embedded into itslearning for the students to view. Watch this video to learn more about how to create a Voicethread lesson and embed it into itslearning. If you don't see the video, remember to look for the shield at the end of the address bar. Click it and select Load unsafe scripts. Click the following link for written directions for how to create a Voicethread lesson. I know that finding time to play with new sites is always an issue, so I hope that this list will help focus your time. My advice is to pick one site and try it. Don't feel like you have to become a master at all of them. Select the "tool" which will help you the most. After you feel comfortable using the site, share it will your colleagues. Check out my list of sites by clicking here. If you have additional sites that you feel will help other teachers, feel free to add them to the comments section of this blog post or email them to me. I will check them out and add to the list. If students use a website to build a project, they may have the option to code the embed code for that project and submit that code in your itslearning assignment. Here are directions for how students submit that code. Type the word or words that you want to use as the hyperlink. For example, if I want to take students to BrainPop, I would type BrainPop as my text. Highlight the word or words by clicking and dragging the cursor over the word(s). Click the Link (looks like a chainlink) icon on your rich text toolbar. In the pop-up window that opens, type or paste the address of the site which you want students to go. When you save the item which contains this hyperlink, you should be able to click on the words with the hyperlink and go to that website. Watch the following video to learn how to post one's School Closure Lesson to the itslearning Planner. If you don't see the video, you are probably in Chrome. Click the shield icon at the end of the address bar and select Load unsafe content. Before hitting play, find the side to side scroll bar below the video and scroll all the way to the right. Move your cursor up to the video and click the mouse. This will display some icons and play options. Click the icon that looks like a monitor to display the video in full screen. To some, using itslearning with a PE class may seem unnecessary, but the PE teachers at Liberty Middle School are using it to support their instruction. They are working to create online units for each of the sports that they teach. Units will contain the rules of the sport, the skills rubric which is used to evaluate students' performance, videos of the sport showing the necessary skills, and online tests. The department is working as a team to create and share the resources. What if every PE teacher were to start doing this? What if instead of students not dressing to participate in class and then sitting and watching, they had to complete an online lesson over the unit? What if instead of having to administer paper and pencil tests in the gym and then having to grade them, tests were given online? Maybe itslearning could be used in the PE classroom in more ways than first thought. Kristen Keith, ELA teacher at South Forsyth Middle School, is taking student journals to a new level. Using the ePortfolio feature of itslearning, she is having her students blog about what they are learning in her class. Here is what Kristen has to say about student blogs. As an English Language Arts teacher, I have been contemplating having my students create blogs for quite some time. I had heard of many different sites and programs, but then discovered that our very own itslearning had a blog feature! This was incredible, since it would be connected to a system that my students were already using daily and could easily access. We explored together as a class and found that each student could customize his/her ePortfolio by adding images and changing the banner style and theme (look) of the home page. I had provided guidance with the first two blog entries- asking my students to reflect on the skills and concepts they had learned so far, as well as on their strengths and weakness in writing. Now that they have gotten the idea, each student is encouraged to blog when they have had an experience that relates to ELA. This could be a connection that they made within another content area (for example, using topic sentences within a water essay students were required to write for Science). In addition to the blog, there is also a portfolio that students can use to upload and keep documents and images. I am excited for each student to be able to reflect back on early work and his/her progress as the year continues. This is also a great way for students to showcase their work to parents and others. Now that more teachers are having students complete assignments and tests in itslearning, I wanted to share a helpful way to print out the grades for those items to assist with entering them into your IC gradebook. By turning on your itslearning gradebook, you can have the grades for tests and assignments go directly to the itslearning gradebook where you can export them to Excel and print. Here are the steps for accomplishing this. Click Settings in the course tree. Click Course Properties and features. Once the page opens, scroll down to the Functions section and check Use Grade book. Click on Follow-up and Reports. On the Add assessment page, click the Existing activities in itslearning. Then, you should see a drop down list of items from the course. Select the item to add to the gradebook. ​*You will see that assessment added to the gradebook. Notice there is a View score as choice towards the top right corner of the gradebook. You can select the % option to see the scores as percentages. **For all assignments and tests that you create after turning on the gradebook, you will see the choice of Add to grade book after you select Score from the Assessment dropdown. Be sure to check this option. ***If you don't see an assessment in the list of items from the course, go to that item in your course and in the settings for the item, make sure that you selected Score for the Assessment dropdown and there is a check in front of the Add to grade book option. Still in the itslearning Gradebook, click the Action button. When prompted, open the downloaded Excel file. ***The Excel export will have all students listed alphabetically, but you can select the entire table and sort by Group to rearrange the list by period. As more teachers are using itslearning tests, the question of, "Can I print an itslearning test?" keeps arising. While there isn't an easy, print test option, here is a way to print your tests. These directions are for using itslearning in Internet Explorer. 1. First you will have to set-up the test so that all questions are on one page. Open the test, click the settings wheel, and select Edit Test Settings. 2. When the test settings page opens, click on the Options tab. 3. In the Question navigation section of the page, select Show all questions on one page. 5. On the page that opens, click Review test button. 6. Once the test opens, highlight the entire test. 7. Right click anywhere in the highlighted area and select Print Preview. 8. When the print preview page opens, find the drop down field which say “As laid out on screen” and change it to As selected on screen. 9. This will show the test as a normal test. Can you believe that Forsyth County Schools has been using itslearning for over two years now? We have come a long way in a short amount of time. As a math teacher, I can easily look at the data and see the growth, but even my literary side has grown to understand the changes that we have experienced. During our first year, the seeds of how to use the platform were sown and seedlings began to develop. During the second year, plants began to grow and bloom, and vines shot out to reach more areas. Now, in the third year of usage, we are seeing fruit and beginning to harvest the results. While we have users at all levels, it is exciting to watch teachers assist one another, share ideas, and implement the tools. I am enjoying having teachers pull me aside to show me things that they are doing in their courses and hearing stories of how students are enjoying the activities. Itslearning will never be able to replace the great work teachers do in the classroom each day, but I hope that we continue to discover more ways to utilize it to support classroom instruction. I am looking forward to seeing all the great things teachers will do with itslearning this year and am thankful that I get to assist along the way. What are Permissions in itslearning? When one creates items in itslearning, he or she can specify which users can view or edit the item by using permissions. This allows the teacher to post items for specific students or groups of students that not all students will have access to. Additionally, permissions can be granted to students so that they can create items within an itslearning course, for example--build pages or tests. What are some ways to meet students' needs by using permissions in itslearning? Jing is a free and simple way to start sharing images and short videos of your computer screen. It is a great tool for creating images for itslearning tests, for creating short videos to demonstrate a task, or just to insert screenshots into a document. It is already installed on all teacher laptops in Forsyth County Schools. You just need to create an account and activate it. Log into your school laptop. Go to the Start menu, select All Programs, select Teachers, and click on Jing. Once you have activated Jing, it should always open automatically when you log onto your laptop. You will know that it is open because of the yellow "sun" at the top, center of your screen. Hover your cursor over the Jing "sun". Three branches will come off the "sun". Click the first branch on the left (capture). Then highlight the area of the screen which you wish to capture as an image or in a video. Do this by clicking and dragging the mouse; release mouse button when you have highlighted entire area. From the menu options that appear, click either capture image (for just picture) or capture video (for recording) icon. Once the image has been captured, you can use the tools on the left of the image to insert text, arrows, or highlights. When you are happy with the image, click the Save or Copy buttons. Insert or paste image as needed. How can one use a Rubric in itslearning? Itslearning has a rubric maker (assessment criteria manager) which allows teachers to build a rubric to use when assessing students on either an Assignment or a Custom Activity. When using a rubric, a teachers clicks where a student falls in the levels of profeciency for a specific category (criteria), adds feedback comments, and saves. Itslearning totals the score and posts the feedback to the students. Students can see the rubric in itslearning prior to their submission in order to complete some self-evaluation. Additionally, teachers can share rubrics with other teachers in their school or across the county. Remember the difference between itslearning Assignments and Custom Activites. Assignments are used when students are digitally submitting work through itslearning. Custom Activities are used when a teacher wants to provide digital feedback on an assessment which didn't require students to submit work online (ie: grading presentations, labs, performances, or projects physically turned in). Bullying Storybook Project by Beth Gliatta, Physical Education/Health Teacher at North Forsyth High School--Ms. Gliatta has been having her students submit their health projects online through itslearning all year, but she is now assessing their submissions by adding a rubric to the Assignments. AP Spanish Presentations by Lisa Robinson, Spanish Teacher at Lambert High School--Ms. Robinson utilized the rubric within a custom activity when she assessed her AP Spanish students giving presentations on Cuentos y Comidas. By using the rubric in a custom activity, she could quickly assess students while they were presenting and didn't have to worry about handing back any papers with feedback or scores. Once she was done assessing all students, she was able to click the link to make Assessments available, and then, students could go into itslearning and see their feedback. What are some ways to meet students' needs by using listening tools in itslearning? For this blog, I am spotlighting different ways that teachers are using listening tools in order to meet their students' needs. Hopefully, these will spark some new ideas for your use. Unit Study Guides by Kelly Fields, Social Studies Co-teacher at North Forsyth High School--Ms. Fields not only posts the unit study guide files for her students in itslearning, but she records herself reading the study guide and answering the questions. This helps those students who may have a reading, writing, or comprehension disability to be able to download the document and then listen to her explanations of the questions. Online Spelling Tests by Tracey Hollabaugh, Study Skills Teacher at South Forsyth Middle School--Ms. Hollabaugh is utilizing the test tool in itslearning to give her students their spelling tests. In each question, she has inserted a recording of her saying the spelling word. Students can then replay the recording multiple times to hear the word again. Posting Vocal Tracks of Songs by Ryan Wason, Choral Director at Lambert High School--To assist students in learning their parts for performances, Mr. Wason posts each of the different vocal tracks of the songs in his itslearning course. Students can then individually listen to and practice their parts. AP Listening Activities by World Language teachers--Several of the AP World Language teachers in the county are helping their students prepare for their AP exams by posting listening activities in their itslearning courses. These activities provide students with unlimited opportunities to practice for the listening skills portion of the exam. The planner is a tool where teachers can list the details of their classroom lessons, post the resources for lessons, link activities that students need to complete, note homework assignments, and list upcoming tests. The itslearning planner is truly the best communication tool that a teacher has since students, parents, and administrators can all view a teacher's planner. When the planner is being used effectively, there is no question about what is happening in the classroom, and students who are absent have a place to go to learn what they missed. The planner is viewable in several places. For students that best place to view a course's planner is on the course dashboard. Users control what is seen in the block by changing the Show dropdown menu. The view options are Last Two Weeks, Last Week, Today, This Week, and Next Two Weeks. Students can view all their course planners at one time by clicking on the Calendar tab and then selecting the Planner tab. They will see a table with each of their class planners showing. Be sure to check the date at the top of the table to make sure you are viewing the correct week. For teachers to add lessons to their planners, they click the Planner link in the course tree. Numerous teachers are doing a wonderful job utilizing their planner everyday. Here are a few that I want to thank for their extra efforts. What is the Registration Tool? The Registration tool allows a teacher to create items, events, or appointments for which students can sign-in using itslearning. It is a great alternative to the paper sign-up lists posted on the wall or the draw a number out of a hat to see who gets a topic. By using the tool, a teacher gets a digital record of who signed up for what, and it also allows one to limit the number of sign-ups per item. What are some additional ideas for how to use itslearning? For this blog, I am spotlighting different ways that teachers and schools are using itslearning beyond the normal features. Hopefully, these will spark some new ideas for your use. Student Performance Evaluations by Catherine Keyser, Band Director at Otwell Middle School--Since the standards for band include students evaluating their performances, Ms. Keyser has her students complete a post-concert wrap-up Discussion in itslearning. Catherine stated, "It is SO EASY to facilitate conversations this way, and they love it. I heard them even comparing out loud what they thought as they were typing their responses." Online Study Chats by Mary Cartenuto, Science Teacher at Riverwatch Middle School--To assist her students as they prepare for unit tests, Ms. Cartenuto hosts online study chats in the evenings using the itslearning Conference tool. She creates the conference in her itslearning course for a set date and time. Students join the conference live to ask her questions concerning topics that they do not understand or need clarified. Student Elections--Every school has a student information course which has all students enrolled in it. Through this course, one could conduct student elections (Class Officers, Homecoming Candidates, Prom, Superlatives, etc.) by using the Survey Tool. Maureen Farry, Yearbook Sponsor at West Forsyth High School wrote, " Last year we used it to do senior superlative voting for the yearbook. I plan on using it again this year. Instead of counting ballots by hand, I was able to use the survey function in itslearning and completed the “counting” in less than 30 minutes!" Courses for Clubs, Teams, or General Groups--Did you know that you can request to have an itslearning course created for you to use with your club, team, or group? Such courses are a great way for you to share information with the group, post pictures of events, hold elections, and communicate quickly with everyone. 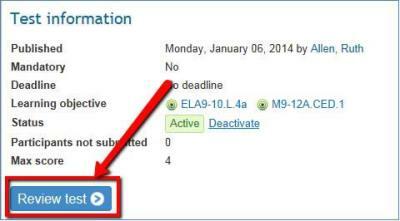 To request a course, simply click on the More tab on the blue bar at the top of itslearning and select Course Request. Complete the form, and then Mike Champion will create your course and email you details about enrolling your students. An itslearning Test provides the opportunity for students to complete both practice and real online quizzes or tests in one's itslearning course. Tests can be made using 10 different question types: Either/or, Multiple Choice, Multiple Response, Short Answer, Open Answer, Select from a List, Fill in the Blank, Matching, Ordering, or Hotspot. Teachers can select whether a student has limited or unlimited opportunities to take the test, whether or not there is a time limit, and can randomize the questions on the test. Test questions can be aligned with course standards to help identify areas of mastery and needed remediation. Additionally, tests can be imported from Examview which makes creation of them easier. Once one builds a test, questions from one itslearning test can be copied into other itslearning tests, which helps with building review assessments. Analytic Geometry Unit Quizzes by Math Teachers at West Forsyth High School--Because the EOC test for Analytic Geometry is online, the geometry teachers at WFHS have been giving their students unit quizzes in itslearning to prepare them for testing online. They build the quizzes in Examview and import them into their content collaboration course so that teachers can copy them into their own courses. Having the students complete these quizzes outside of class also helps with classroom time management. Self Paced Instruction by Eric Eben and Jeremy Hedges, Latin Teachers at South Forsyth High School--Dr. Eben and Mr. Hedges are using itslearning tests to make their courses almost entirely online instruction. When students come to class, they know to log into itslearning and begin working on posted lessons. Students work at their own pace and seek assistance from their teachers when needed. To check their mastery of content, students complete unit quizzes and tests in itslearning. Midterm or Unit Test Review--Teachers can post a review test in their itslearning course and allow the students unlimited times to take the test. This would provide students additional practice and feedback in preparation of the upcoming test. Online Learning for School Closure Lessons--As teachers are preparing for the possibility of making up missed school days through itslearning lessons, several teachers are using itslearning tests to assess the students' understanding of the lesson. Teachers type the information for the lesson into the description of the test, and then once students completes the lesson, they click the Start Test button to take the test to show level of mastery for the lesson. An Assignment is a way for students to digitally submit their work to their teacher. In our previous LMS, we called this feature "Dropbox". An assignment can be used for students to turn in daily homework, to respond to ticket out the door questions, or submit projects. By using an assignment, a teacher can eliminate the collecting and returning of papers. Assignments allow teachers to view student submissions, provide comments and feedback, check for plagiarism, and provide a grade. If students are working in groups, the teacher can even assess them as a group. One great feature on an assignment is the Send reminders link with automatically sends an email reminder to all students who haven't completed the assignment. Performance Based Assessment Practice by Kristin Keith, Language Arts Teacher at South Forsyth Middle School: Ms. Keith is using the assignment tool in itslearning to have her students read a story and then ACE (Answer, Cite, and Explain) questions about the story. This is a great way to prepare students for the Georgia Milestones test without using class time. Math Journals by Karen Wagoner, Math Teacher at North Forsyth Middle School: Ms. Wagoner assigns her math students weekly math journals using itslearning assignments. The journal topics vary from activities using math vocabulary, mathematical reasoning, to problem solving. This practice helps students explain the math process, develop critical thinking skills, and exercise creativity. Oral Recordings by Laura Hunt, Spanish Teacher at South Forsyth High School: In her Spanish V class, Ms. Hunt had her students submit audio recordings as their responses to posted pictures and questions about Spanish culture. Students used the built-in insert New audio recording feature in the assignment to record themselves. This was an effective way for students to practice the speaking strand of their curriculum. Project Submissions by Rhetta Roy, Social Studies Teacher at Lambert High School: When Ms. Roy has her students do presentations in class, she has them submit the presentations in an assignment in itslearning. As students present in class, she then pulls up the submissions from the assignment instead of having students log in and out or have to pull up their presentations from jump drives. This method helps make presentations proceed a little faster and gives her access to the presentations at the same time. A Discussion is an online "conversation" between students and teachers. It can be compared to a classroom discussion, but it is held virtually in one's itslearning course. Discussions usually center around questions involving opinions and ideas, not questions with concrete answers. Students who do not like to speak in class sometimes flourish in discussions because this format allows them to share their thoughts in a less intimidating environment. Discussions can be completed during or outside of class. Essential Question Discussion by Anita Perez, Social Studies Teacher at West Forsyth High School: Ms. Perez has her AP US History students participate in a discussion to start every unit. In the discussion, she posts the essential question(s) that will be addressed in the unit. The discussion gets the students thinking about the topics which will be studied in the unit prior to the classroom instruction. Benjamin Franklin Virtues Discussion by Mimi McConnell, English Teacher at North Forsyth High School: After reading an excerpt from Benjamin Franklin's autobiography on virtues, Ms. McConnell had her students participate in an itslearning discussion. Students chose three virtues from Franklin's list that they felt would improve their life and then attempted to make changes in those areas. Students posted entries on their choices, their progress, and encouraging one another's progress. Each entry had to be at least one, well-developed paragraph with correct grammar, spelling, and conventions. Deforestation Discussion by Callie Davis, Science Teacher at West Forsyth High School: To help prepare her students for online college courses, Ms. Davis has begun using itslearning discussions in her AP Environmental Science classes. She recently had students discuss the importance of forests. Students had to watch videos on the topic, answer questions about their opinion including supporting factors, cite their sources, and reply to other students' posts. Book Reviews by Donna Zaryski, English Teacher at South Forsyth Middle School: To increase students' interest in reading and improve their writing skills, Ms. Zaryski has her 6th grade students complete book reviews in a discussion. Students must state what they liked or disliked about the books that they read, not write a summary of the book. Class Debates--Divide into groups and post threads for and against the two sides of the debate. Election Issues Discussions--Discuss issues in current elections. Review Discussion--Create a discussion where students can post questions while studying for a quiz or test. Students can then answer each other's questions. Current Issues Discussions--Post questions about current news topics. Make copies of the discussion for different periods and assign permissions to them so that students only see their period's discussion. Use the Reports tab for a summary of how many posts a student has made. Click the student's name and see all that student's posts together. One of the resources in itslearning is a Page. A Page is a collection of content blocks usually about the same topic. The content blocks can contain files, web links, images, text, embedded videos, or poll questions. The development of the page is completely up to the creativity of the designer. Unit Pages by Catherine Emory, English Teacher at Lambert High School: Since Ms. Emory teaches in units, pages is a great way to have all the information for a unit in one place. She divides resources such as study guides and project information and rubrics in one content block, short videos in another block, text in another block and pictures in other blocks. Pages are an attractive and easy way to find all the information needed for a unit. Daily Lesson Pages by Donna Governor, Science Teacher at North Forsyth High School --Ms. Governor creates a page for her daily lessons. Each page has a Looking Back block, Today's Files block, Links & Resources block, and Review block. Student Introductions by Alashia Cody, Language Arts Teacher at Otwell Middle School--Ms. Cody had her students create pages in her itslearning course to introduce themselves to each other at the beginning of the school year. Each page had to contain five content blocks where the students answered questions about themselves. Poster Project by Robyn McEntyre, Literacy Teacher at Otwell Middle School--While completing a novel study with her students, Ms. McEntyre had her students research the 1960's and create digital posters (pages) to show what they learned. In my blog this year, I am going to spotlight the great work that Forsyth County teachers are doing in their itslearning courses to help students in their learning. FCS teachers are going above and beyond to supplement their classroom instruction with digital resources and opportunities through itslearning. This blog is meant to both recognize teachers for the work that they are accomplishing and to share ideas with others. I look forward to showcasing what our teachers are creating. To print a lesson from the planner, do the following. In the Show Drop down, select what you want to display and print (All, This Week, Today). Put a check in box in the upper right hand corner of the lesson. Click on the settings wheel. 5. From the settings menu, click Print. Now that you have been given and shown many tools and features within itslearning, it may be getting difficult to remember everything that you have been taught. As the year has gone, I have written directions on all of the tools that we have studied. But how do you find those directions? The search feature of itslearning is an excellent tool to help you locate anything, anywhere in itslearning. To use the search tool, simply type a keyword in the Search feature at the top right hand corner of any itslearning page and click enter. Any item, within any courses which you are enrolled, that pertains to that topic will be listed. Click on the item which you need. Over the last few weeks, we have learned a great deal about Learning Station, and I wanted to pass along a few helpful points to assist you in your creation of tests. Always use Chrome as your browser when working with Learning Station. Learning Station doesn’t display well in Internet Explorer. If you get a blank, white page when you open Learning Station in Chrome, find the shield symbol at the right end of the address bar. Click it and select Load unsafe script. While building a test, if you get a Generating Questions screen which doesn’t go away, hit the ESC key. This will get rid of that screen but allow you to continue to build your test. Don’t Edit copies of a test. Whether your own test or a shared test, do not edit a copy of a test. Learning Station uses a database system for their test questions instead of individual test files. All of this means that if you edit a copy of a test, it also changes the questions on the original copy of the test. Students with same last name are listed in alphabetical order. On the new class roster answer sheets, students with the same last name may ask which one is their name. The number after the last name is the personal ID number from IC, but the easiest thing to do is realize that the names are in alphabetical order. Students can write their name at the top of the answer sheet. This will not cause issues with scanning but will help if students forget to bubble their name. If someone deletes an item in an itslearning course but needs that item again, it can be restored from the trash can. Deleted items remain in the trash can for 30 days. Complete the following steps to restore an item from the trash can. Log into itslearning and go to the course where the item was deleted. Click the Trash Can link in the course tree. Once the trash can opens, find the deleted item in the list of items and click the box in front of its name. At the top of the list of items, click the restore button. The item will be placed back into the course. When typing on iphones and ipads in itslearning, the keyboard typically doesn't stay displaying. As one types a key, the keyboard will disappear. To keep the keyboard constantly open, find the Next button in the upper left corner of the keyboard. Click then Next button, and the keyboard should stay visible until you close/collapse it. Chrome is the best browser to use when working with Learning Station. However, Learning Station doesn't like to open in Chrome without being given permission to load the content. Complete the following steps in order to use Learning Station in Chrome. 1. After logging into itslearning and clicking the Learning Station tab, find the shield in the upper right hand corner of the page, in the address bar. 2. Click on the shield. 3. You will then see a pop up window like the following. Click the Load unsafe script link. 4. If prompted to enter username and password, do so. Learning Station should now be displayed. Go to the course where you wish to add an RSS feed content block. On the course dashboard, click +Add Content Block. From the list of choices of items to add, select RSS. When the Create RSS block opens, type a Block title. Paste in the URL for the RSS feed. Set settings for how many items to show and how to display them. Find the search box next to View Planner for and type the last name of a student in one of your courses. If you get a list of multiple students with that last name, select the student from the list. Additionally, when one is in a course planner, there is a shortcut at the top of the planner which says View all my planners. Click that shortcut to go to the "one stop shop" of planners for all courses. Teachers have been asking how to display fewer lessons in their planners so they don't have to scroll down so far to add a new lesson. Go to your planner in a course. Find the Show drop down. From the list of choices, select This Week. This will at most give you only 5 lessons to scroll down and add new lesson. Open the course with the students who you wish to email. Click the Participants link on the course tree. At the top left hand side of the table of students, click the Send email button. It will ask if you really want to send an email to all students in the course. Click OK.
Scroll down and hit Send. Click on the Hide Menu icon located to the left of the Go to... drop down. To unhide the menu, click on the Hide Menu icon. Click the up arrow located on the right side of the gray menu bar (straight down from one's name). To show the menus again, click the down arrow located on the right side of the gray menu bar (straight down from one's name). Find the column of stars in the table of courses. Check drop down list or courses list to see that course has been removed from the list. The course will always remain on the Courses tab page and can be readded by clicking the star again.